I asked yesterday for Stoke to be put to the sword but it seemed the football gods decided to allow Manchester City to score six goals against their much hated rivals rather than Arsenal. Still, three points is what we all wanted for the Gunners and it's exactly what we got. And whilst Stoke aren't our rivals - because they are not anywhere near the same level as us - it was good to get a victory against them. Have I ever told you I don't like Stoke? Arsene Wenger made a few changes to the starting 11, with captain Robin van Persie dropping to the bench and Marouane Chamakh getting the nod. Gervinho was given the nod over Andrey Arshavin; Aaron Ramsey came in for Tomas Rosicky and at right back Johan Djourou was handed a start in place of the injured Carl Jenkinson. The Gunners bench told you everything you needed to know about how Wenger planned to play this game. He had no defenders on it. Whether that's because Sebastien Squillaci and Ignasi Miquel aren't 100 per cent or whether he knows we could rearrange the team to cope with an injury if that was required I don't know. I thought we started the better of the two team. We had plenty of possession but as per usual at the moment we didn't know what to do with it. The wide players in Walcott and Gervinho weren't linking up with Chamakh and the midfield didn't seems to be able to find a cunning pass which would beat the Stoke back line. They tried to be well organised with two banks of four and the Gunners were finding the going tough. Aaron Ramsey looked more positive and seemed to have a spark about him. But when there was little movement in front of him the Welshman couldn't provide the ball which would split the defence and provide Arsenal with an opportunity to shoot on goal. Gervinho made one run in the opening quarter of an hour but Begovis was on to it. And it was the same pair who worked again to create Arsenal's opening goal. Ramsey playing a ball over the top which Gervinho had made a Freddie Ljungberg sytle run on to and beat the Stoke goalkeeper this time. And the Welshman could have had the Gunners second with a low dive minutes later but that flew wide. With a one goal advantage, Arsenal looked very flat. Marouane Chamakh is a player lacking in serious confidence and the disadvantage of not playing hardly any minutes for the Arsenal this season. He had a couple of glorious opportunities to put the ball in the back of the net - these weren't open goals by any means - which you would expect a top class striker to put away but he's so out of form it's worrying. The Moroccan tried to do everything right but when things aren't going for you, they aren't going for you. However he didn't hide away. He made himself available and busy and pulled the Stoke defence around, which helped create space for his team mates, by dropping deep or wide to pull the central defenders with him. I know others will say he was ineffective, but no player is up and running at full speed on their first Premier League start of the season, having only played in the Carling Cup third round and started two Champions League games. Personally I thought Theo Walcott yet again was completely out of the game. He was so, so poor in the first half. And looking back on Andrey Arshavin's cameo, it appeared the Russian did more on the pitch for the 19 minutes he was on the pitch than Walcott did in 71 minutes, but I digress. Stoke's goal came from unsurprisingly a set piece. It was woeful defending from the Gunners, but what's new? No one was marking Ryan Shawcross on the edge of the box (Johan Djourou's man) and he had a free header which was played across the box, flicked on by Matthew Upson, played on by Jonathan Walters with Peter Crouch having the final touch. It was a very disappointing goal to concede especially when the captain said before the game that every defender had to "die" for their zone. Although it appeared that Arsenal weren't playing a zonal marking system, it was clear we weren't man marking either. It wasn't until the second half when we stepped up a gear. We totally dominated and Gervinho looked like he was on a different level. He was dangerous when on the ball and all he needed was someone to get on the end of his final ball to score. But unfortunately it didn't appear any of his team mates wouldn't be busting a gut to get into the box to score. Until the arrival of Robin van Persie in the 66th minute. The Dutch striker really is in a rich vein of form at the moment and Wenger's men would be in a bad place without him. He was there to get on the end of two Gervinho crosses the first in the 73rd minute and the next nine minutes later in the 82nd minute which put this game beyond the visitors. Special mention must go to Aaron Ramsey who I thought had an excellent game along with my man of the match Gerviinho and Laurent Koscielny did very well in defence. I should also point out the referee was particularly bad. Lee Mason made some shocking decisions all over the pitch and could have ruined this game easily. Luckily for us, we had Robin van Persie, who made the difference. "We had a solid team performance where you could see that the team improves defensively, especially against a team that is challenging like Stoke. "We looked much more solid defensively and we had a good start to the game until they equalised. Then I felt we became a bit nervous and we needed half time to calm down and then come back. "The second half basically was all us, especially after the first 15 minutes, and then the problem was to score goals. 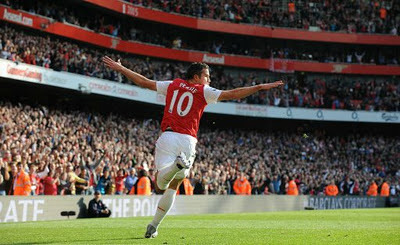 Van Persie can do that better than many people and he did it when he came on." Personally I was very frustrated at half time. I think we could have done better with our chances and we lacked invention. We needed a Rosicky, Arshavin or Benayoun to make that difference. We also needed a Robin van Persie to put the ball in the back of the net. It was also disappointing to see so many empty seats. Especially in the same week as the AGM. It doesn't send out a good message. There will be little rest of some of this squad who will be back in training today for tomorrow night's Carling Cup match with Bolton. It will be interesting to see what kind of team the manager puts out. Six wins in seven games has to put a smile on your face. Also knowing we'll face Chelsea without Drogba next weekend, has to put a spring in your step. Monday's aren't always my favourite days, but I will certainly have a spring in my step. Until tomorrow.